Astronomical destiny approaches. On August, 21st, 2017 the very tip of the moon’s shadow will travel across the face of the Earth, zooming across North America in less than two hours. 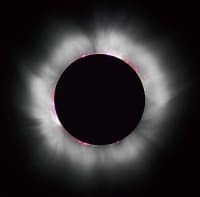 The states of Oregon and South Carolina will serve as entry and exit points respectively, the first total solar eclipse contained entirely within the contiguous United States in its 241 year history. 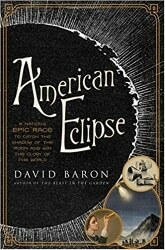 In American Eclipse, journalist and solar eclipse fanatic David Baron has written about an earlier event that had a profound effect on the development of science in America. It was July 29, 1878, and totality was set to race diagonally across the width of America, in a narrow strip from Louisiana to the state of Washington, attracting scientists and amateurs from all over the nation. While this year’s eclipse may prove to be more tourist attraction than a scientific boon, back in 1878 solar eclipses were one of the few ways to learn anything about the sun. At the time, scientists had gradually been learning more about the giant flaming globe in the center of the solar system, but eclipses presented a rare opportunity to view the sun and its surroundings when it wasn’t so darn bright. A total solar eclipse in 1999. Moreover, American scientists suffered from a serious inferiority complex. Their European counterparts had centuries of tradition and steady sources of funding for their scientific endeavors, making it hard for the Americans to compete. It was a fervent desire to show the Europeans a thing or two that drove scientists from the eastern United States to trek across the barely charted expanse of the massive North American continent, lugging their equipment to brand new towns like Rawlins, Wyoming and Denver, Colorado. The author focuses on three very different individuals, each of them prominent scientists, who took advantage of this event to further their scientific goals. Already a minor celebrity – having become the first woman inducted in the American Academy of Arts and Sciences in 1848 – astronomer Maria Mitchell led a group of female scientists from Vassar College to Denver to observe the eclipse. This was at a time when conventional wisdom still held that too much science and intellectual effort could actual cause physical harm to women. James Craig Watson – the acclaimed Canadian-American asteroid hunter – also made the trek from Ann Arbor, determined to discover a new intramercurial planet . The planet already had a name – Vulcan – and the eclipse was the perfect opportunity for America’s foremost astronomer to make yet another astounding discovery. 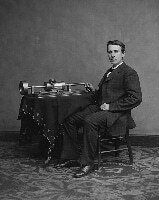 Thomas Edison and his phonograph in 1878. Lastly, and most curiously, was Thomas Alva Edison. Already a celebrity – even before inventing the incandescent light bulb – he joined the excursion to test his new tasimeter, a device he devised to measure the temperature of the Sun’s corona. Unfortunately, he hadn’t had an opportunity to learn how to use the instrument before he got off the train in Wyoming. Recreating the scientific excitement that steadily built up for this singular event – just a few minutes in duration – Baron deftly weaves these three primary stories together to create a thoroughly entertaining account, sprinkling in plenty of additional tales along the way. Only two years after George Armstrong Custer had taken his last breath on a hillside in eastern Montana, a handful of brave scientists risked their lives for just a brief moment of scientific splendor. American Eclipse captures the enthusiasm and fascination that accompanied this unique moment in the history of American science. It’s sure to intrigue anyone who’s planning to take in the 2017 version.